Here’s what’s up in the world of TV for Friday, October 5, and Saturday, October 6. All times are Eastern. 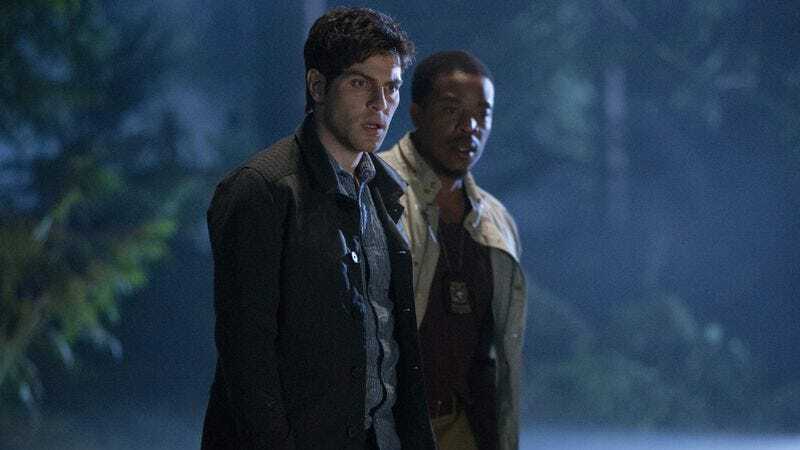 Grimm (NBC, 9 p.m., Friday): In case you were looking for Grimm—which is understandable, given how NBC moves it all over the schedule—it’s back on Fridays. Tonight, Captain Renard meets up with a European acquaintance, which sounds… exciting? We suppose? Then there’s a bunch of foofaraw about the “Wesen” and all the other mythology stuff that makes absolutely no sense to us but might make sense to you, provided you’ve seen every episode of the show like Kevin McFarland has. Maybe you can explain it to us in comments; maybe we’ll even read about it. Boss (Starz, 9 p.m., Friday): The city slouches ever further toward bankruptcy, and Kane needs to find a way out of the predicament. We’re hoping the solution involves as many Shakespearean monologues as Kelsey Grammer can shake a stick at. Sonia Saraiya’s review of this episode will be in blank verse. Fringe (Fox, 9 p.m., Friday): The once and future Fringe division heads to Harvard to see if they can get the tools they need to fight the Observers in Walter’s old lab. We’re guessing that since it’s been 20 years, the place is now littered with old beer cans. Noel Murray might even be squatting there. Gravity Falls (Disney Channel, 9 p.m., Friday): We’ve been sort of avoiding this one, because everybody we know is giving us the hard sell on it, but a Halloween episode featuring a monster who craves candy? Why, count us in, Gravity Falls! Count us in! Now to cram on the show’s back-story with Alasdair Wilkins. Strike Back (Cinemax, 10 p.m., Friday): The season’s final two-parter begins with the setup that will inevitably explode in the season finale, airing next week. Myles McNutt is wondering what it’s going to take to get you to watch this program, and he’s not afraid to use this rocket launcher to make you do so. Young Justice (Cartoon Network, 10:30 a.m., Saturday): The loyalty of Aqualad is tested when… wait. Where are you going? Don’t you want to see an episode about Aqualad? But he’s great! And he talks to fish! Oliver Sava would never turn his back on Aqualad. How dare you do so now? How dare you? Saturday Night Live (NBC, 11:30 p.m., Saturday): Daniel Craig is here, and we’re sure he’s got a killer Jim Lehrer impression ready for the inevitable sketch making fun of Wednesday’s debate. Either that or David Sims will get to find out if Craig’s got what it takes to lampoon Miguel Cabrera. Firefly (1 p.m., Friday): Noel Murray and Donna Bowman reach the conclusion of their journey through the series proper, with the finale, “Objects In Space.” Expect interstellar bounty hunters and the usual panoply of space weirdness. Next week, we get into Serenity. You’re a leaf on the wind, guys. Keep it up. The X-Files/Millennium (1 p.m., Saturday): Todd VanDerWerff is sure he’s seen this X-Files, but he remembers almost nothing about it, which is usually… well, it’s not a good sign. He’s never seen the Millennium, but it’s called “Darwin’s Eye,” so that should be wacky at the very least. Hollywood Goes To Washington (TCM, 8 p.m., Friday): Turner Classic Movies celebrates Hollywood’s fascination with politics in an hour dedicated to movies made about the city often called Hollywood for nerds or Hollywood for the unattractive or… whatever you would classify Senator Tom Coburn as. Monsters Inside Me (Animal Planet, 8 p.m., Friday): Finally, Animal Planet is doing the tough work of digging into just why this one family’s daughter would only eat cat food, in an episode entitled, helpfully, “My Child Will Only Eat Cat Food.” We’re going to guess it’s the parents’ cooking, honestly. Forecast: Disaster (National Geographic, 9 p.m., Friday): The title of this show sounds like something you should start saying when you’re headed out for some sort of fun. “My forecast?” you can say to your friends. “Disaster!” And then you can arch your eyebrow and look kind of stupid doing so. Man Caves (DIY, 10 p.m. Friday): In tonight’s episode, the Man Caves team turns an old TV and radio station into a place where two men who just want to watch sports can get away from it all, and by “it all,” we mean the women they married at one time because they thought they loved them. See Dad Run (Nickelodeon, 8 p.m., Saturday): We’re picturing the casting process at Nickelodeon to simply be the network heads digging through a box of people whose shows used to be on Nick at Nite, then tossing them in new shows vaguely similar to their old ones, which is why Scott Baio has returned. Austin City Limits (PBS, 9 p.m., Saturday): What better way to close out your weekend than watching Radiohead perform on the latest season premiére of this long-running PBS concert series? Well, you could probably also win several million dollars, but watching this and liking it seems far more likely. Bad Teacher (Encore, 8 p.m., Friday): It’s not a great movie, but Cameron Diaz is a surprising amount of fun as the woman in the title, whose main goal is to help her students win a contest that will pay for the breast implants she needs to seduce Justin Timberlake. You know! That old story you’ve heard before! Mr. Smith Goes To Washington (TCM, 8 p.m., Friday): If your Jimmy Stewart impression consists entirely of lines from It’s A Wonderful Life, maybe it’s time to brush up on some of his other performances and add the entirety of his epic filibuster from this movie to your repertoire. Cobra (G4, 8:30 p.m., Saturday): Sylvester Stallone! Brigitte Nielsen! 1986! A cop who takes the law into his own hands! Do you seriously need anything more than that? You do? All right, could we entice you by saying that this was directed by George P. Cosmatos? Yeah, we knew you’d like that one! MLB Playoffs: Wild Card games (TBS, 6 p.m., Friday): Major League Baseball begins its march to the World Series with the first two games of the playoffs, the brand-new Wild Card one-game playoffs. In the first, the NL’s Cardinals and Braves face off, followed by the Rangers and Orioles’ match-up. College Football: West Virginia at Texas (Fox, 7 p.m., Saturday): We’re always pulling for West Virginia, because we often figure, hey, what else do people from West Virginia have, right? But we do like cattle, so the Texas Longhorns just might… ah, who are we kidding? Go, West Virginia! Bring your state hope! Scandal (Thursday): We didn’t think it would be the case, but we’ve come to enjoy this bit of Shonda Rhimes preposterousness because of how insanely propulsive it can be. Plus, it’s got one of the best ensemble casts on TV, with everybody pulling their weight. Ryan McGee likes plot twists!